So I’m coming at you with an unusual Monday Week in Bentos post this week. Last Friday was Wyatt’s last day of school and he got out early, and I was running around all morning and never got my act together to post my weekly round-up. You can see that I immediately put myself on summer time! 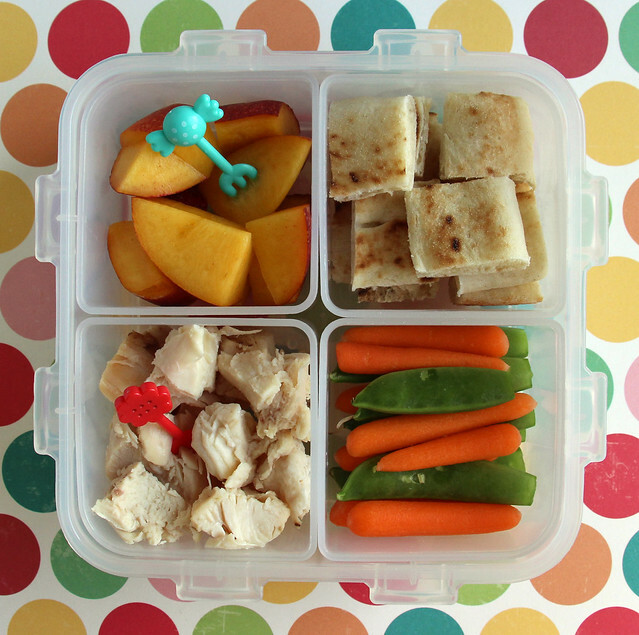 Augie used our square Lock & Lock bento for lunch on Monday and I filled it with chunks of nectarine, squares of garlic naan, leftover roast chicken, carrots and sugar snap peas. I included a couple little fork picks that look like sweets with the fruit and chicken so Augie didn’t have to use his fingers to eat them. 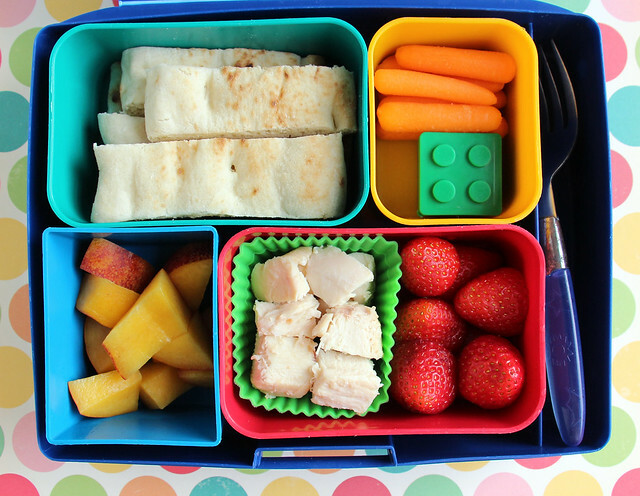 Wyatt’s lunch was packed in the Laptop Lunches bento box: strips of garlic naan, carrots, a little Lego box filled with black bean dip, nectarine chunks, chicken in a square silicone cup and strawberries. 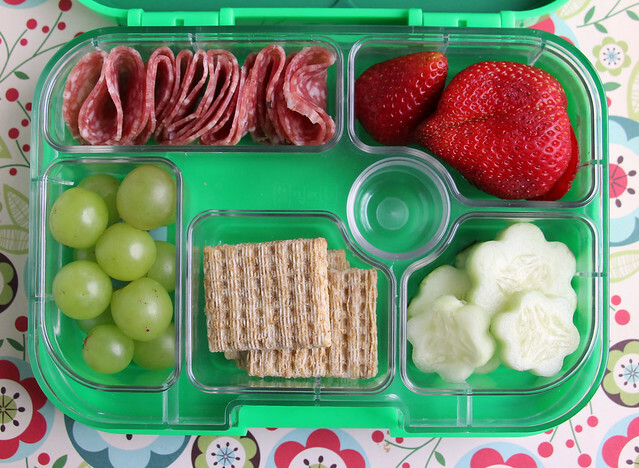 Tuesday Augie had salami, wheat thins, grapes, a big honkin’ strawberry, cucumber slices and grape tomatoes. I packed his lunch in our Lunchbots Trio. 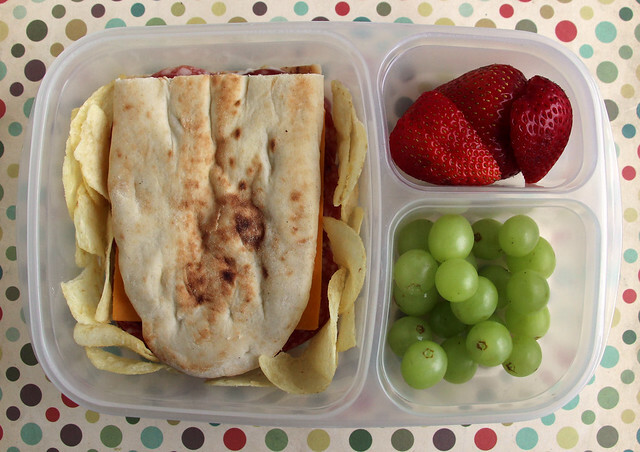 Wyatt had a salami, cheddar and pesto sandwich, a few chips, strawberries and grapes. This was packed in an EasyLunchboxes box . On Wednesday, I made Augie a kitty sandwich with our Cutezcute cutter set . I think it was peanut butter and jelly but I can’t remember for sure. 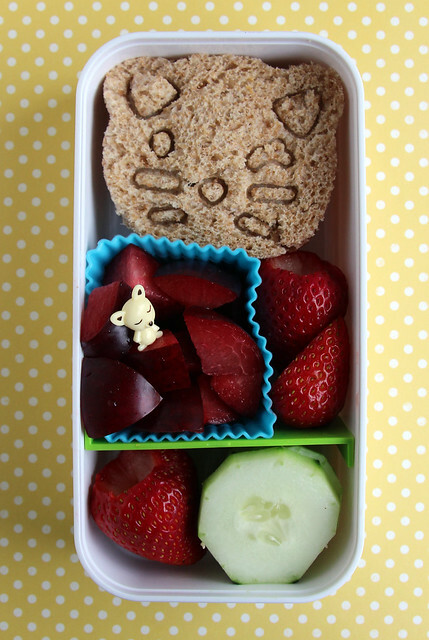 He also had chopped plums with a little fox pick (I thought it was a mouse when I packed it but now that I look at it, I see that’s pretty obviously wrong), strawberries and cucumber slices. This was packed in a single layer of our monbento box. 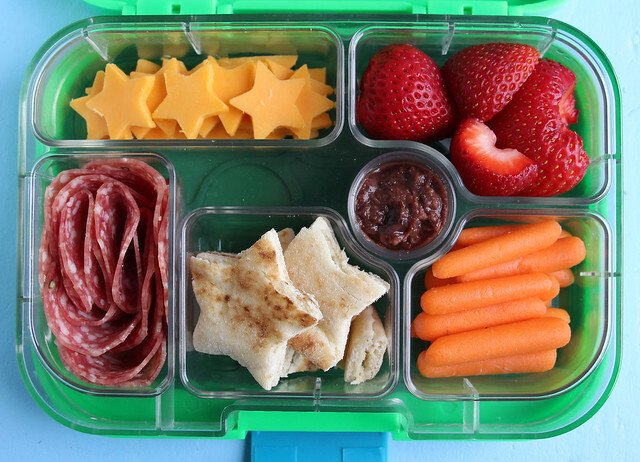 Wyatt had a lunch in the Yumbox : cheddar cheese stars (the scraps are underneath), strawberries, salami, naan stars, carrots and black bean dip. 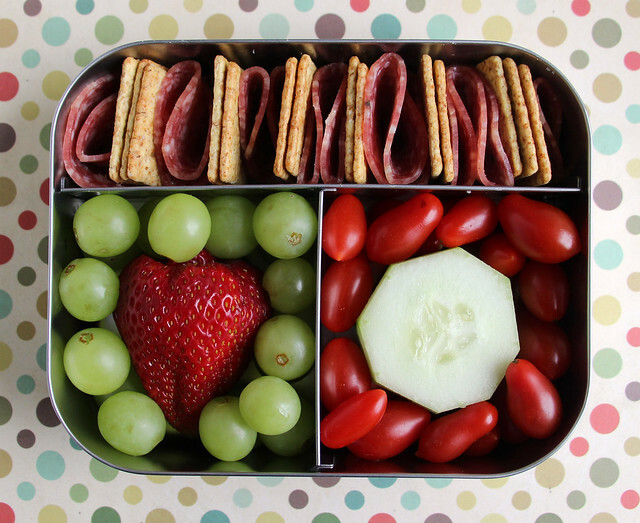 And then Augie had the Yumbox on Thursday: salami, strawberries, cucumber flowers (I was reminded of the technique when I saw this lunch Melissa posted the other day), Triscuits and grapes. Wyatt got a special lunch for his last full day of the school for the year: plums with one of those donut picks, chips, grapes and a salami and cheese sandwich. 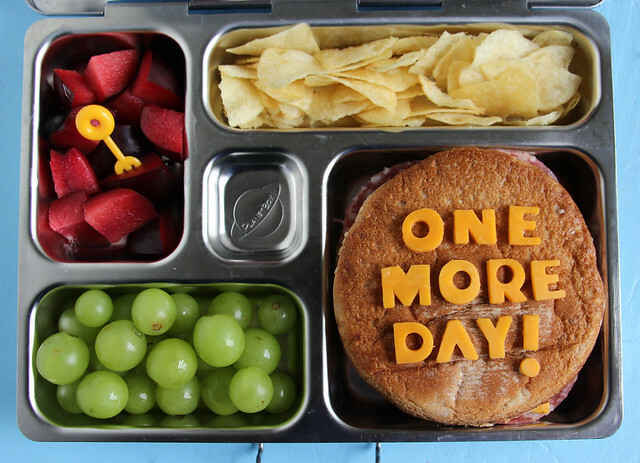 I spelled out “ONE MORE DAY!” on top of the sandwich with letters I cut from the cheese to set a celebratory mood! Woo hoo! No lunch for Wyatt on Friday because he got out early. I packed something for Augie, but I accidentally deleted the pictures from my camera. I have NO idea what I sent for him either!